The imperfections vary but all are very small and won't be noticed when worn. 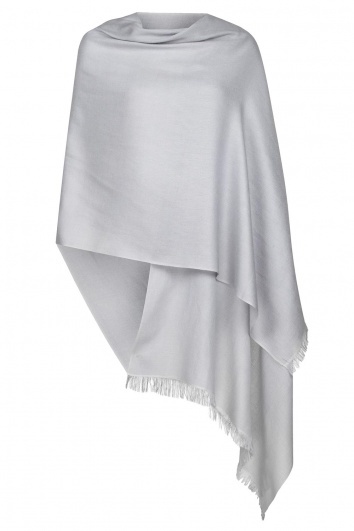 A lighter weight - very fine, soft cashmere and silk silver grey pashmina. If you're looking for a quality cashmere wrap which is soft, fine yet warm then you've found it! Very slightly imperfect with £30 off. Comments: Very simple to place order. Good follow up by email and exceptionally prompt delivery. Comments: Exactly what I hoped it would be. I was thrilled with my purchase. The whole transaction was smooth and delivery was super quick. I have already named the company in conversation with friends. Comments: It felt like a very personal service and the product was great. Just lovely. Imperfect so half price, but the fault was indetectable. Excellent swatches and customer service. Comments: Excellent swatches and customer service. The imperfection did not detract from the shawl and was good value. Excellent quality, easy order and delivery. Service rating: Easy to order, quick & efficient delivery.. Have bought from this company several times. Product: Delicate colour, lovely quality. Helpful care instructions.